Insurgency and Counterinsurgency: a Global History. Jeremy Black. Lanham: Rowman and Littlefield, 2016. 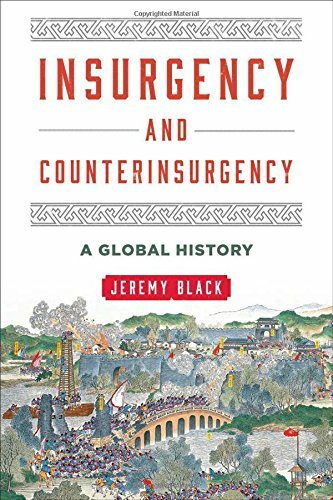 As the armies of the West begin a shift away from counterinsurgency (COIN) and the US Army, in particular, renews its focus on peer on peer warfare, the timing of the publication of Insurgencies and Counterinsurgencies by Jeremy Black could seem to have missed the COIN revolution. In the age of a resurgent Russia annexing the Crimea and threatening Baltic NATO members with a similar fate, is COIN still relevant or is it an idea to confine to a dusty shelf while the West learns how to confront Russian cross domain coercion and multi-domain battle? Despite the cognitive shift from COIN back to a paradigm of armor and mechanization, “wars amongst the people” - a phrase that popularized in Rupert Smith's The Utility of Force - are here to stay. The 2014 US Army Operating Concept highlights that “adversaries operate among the people in urban areas and other complex terrain to avoid U.S. military advantages and they operate in cities because war, as a political phenomenon, is inherently about people.” Furthermore, the UK Strategic Trends Programme emphasizes that by 2045, 70% of the population will be living in urban areas, in part to husband resources. Competition over those limited resources is highly likely to trigger conflict. Along with this focus on the population, comes the rise of non-Western nations as regional and world powers. It is in this context that Jeremy Black’s book aims to add a deeper level of understanding to sub-state war from the global perspective. Jeremy Black is a Professor of History at the University of Exeter and a senior fellow at the Center for the Study of America and the West at the Foreign Policy Research Institute. While better known for his British history, Black has contributed significantly to the global historiography of war. His publications contain a prevalent theme: Western military history is based on ethnocentrism, which limits our ability to understand the cultural dimension of war. Insurgency and Counterinsurgency continues very much in this vein. This pretext offers the book a unique place among Western literature on insurgency. Black’s methodology traces insurgencies from antiquity to the present day, examining the military and political dimensions, how the outcome of each conflict created cultural paradigms in the waging and defeat of insurgencies, and their effect on military doctrine and national policy. As previously highlighted by Chris Zeitz, Western retrospective sense-making trends towards a simple and often superficial narrative and our military history is no exception. This book provides the military professional with the vicarious experience of fighting insurgencies and counterinsurgencies, through the ages and across the globe. It fills a crucial gap in the Western understanding of intra-state conflict and how the interests that inter-state actors play out in them. In particular the book sheds light on cultural perspectives on organized violence for political ends and the utility of insurgency in cultures other than our own. The book’s content is thematically and temporally laid out, and traces the nature of insurgency from the fifteenth century to the present - from the Christian and Islamic wars of religion, Asian powers struggles, the Revolutions of the Eighteenth Century, the rise and subsequent rejection of Imperialism, and culminates with the failed interventions of the Twentieth Century. Throughout the text, Black unpacks the interpretation of intra-state violence as a systematic coupling of beliefs, events, culture, and politics that has created lenses for both the insurgent and counterinsurgent. The crucial theme Black highlights is that an understanding of one insurgency does not grant one knowledge of others, and similarly predetermined policy prescriptions stymies action and understanding. However, what this book does not do is attempt to provide any new perspectives on the future of sub-state political violence. Instead it provides a framework to see how cultural bias predetermines our anticipation of the future. For example, in Black’s opinion, the Western materialist view leads to a perception that future insurgencies will increase due to population growth, which will lead to resource competition and revolve around urban areas. The prediction in itself is not profound, David Kilcullen came to the same conclusion in Out of the Mountains, but Black’s exposure of our logical bias is revolutionary. He also draws attention to the criminal links to political violence; criminals exploit the civil unrest that fosters insurgency because both criminals and insurgents stand to gain materially through a mutually beneficial relationship. Both the Provisional IRA in Northern Ireland and the Taliban in Afghanistan are well-known examples of mixing crime and political violence, and Peter Andreas’ Blue Helmets and Black Markets gives an authoritative account of the phenomenon during the siege of Sarajevo, but the connection to the Western material bias is a new angle. These predictions of future sub-state violence are not innovative in themselves, but they also are not the mainstay of the book, they merely serve to demonstrate how an ethnocentric approach to insurgency biases our interpretations of it. What the book does do is give a fresh perspective on the use of organized violence for political ends and its utility in cultures other than the West. For example, religion has played a factor for inciting political violence in the formation of India in the seventeenth and eighteenth centuries and continues to influence current events. The Hindu insurgency against Aurangzeb, the Muslim sixth Mughal Emperor, which contributed to the fall of the Empire, is still employed in contemporary Hindu political narratives. These narratives highlight the utility of violence in preserving Hindu society and played no small part in contributing to the violence seen in the 1947 partition of India. Turkey presents a contrary perspective, where insurgency has historically been a tool employed to break up alliances. The Western backing for the uprisings that preceded the collapse of the Ottoman Empire support this view, such as Anglo-French-Russian support for the Greek insurgency in the 1820s, and British support for the Arab revolt during the First World War. Layering this perspective helps to interpret the current Turkish view of, and reaction to, the activities of the PKK and Daesh in Turkey and its environs. Layering this perspective helps to interpret the current Turkish view of, and reaction to, the activities of the PKK and Daesh in Turkey and its environs. Black’s analysis of the utility of political violence in cultures other than our own is another key takeaway from the book. For example, the Chinese, shaped by their long experience of sub-state violence, from the White Lotus insurgency in 1796, through the Chinese Civil War to the contemporary Uyghur movement, view this phenomenon as an ‘internal war’ rather than a violent expression of politics. Therefore, from China’s perspective the political accommodation of the insurgent is not viewed as a viable policy. This view is in contrast to the Western model of mainly external interventions to bring about a political settlement. In the Islamic culture, insurgency is a method of state formation. One prime example of this is the formation of Saudi Arabia as the result of a Wahhabi rebellion against the Hashemite Kingdom in the aftermath of the First World War. This perspective, in turn, may go some way to explaining the sometimes-contradictory stance that Middle Eastern countries take when supporting political violence in other Arab states. By understanding the perception of the utility of political violence in non-Western cultures, it allows those involved at all levels of Western national security to cast our actions in these regions in the light they may be perceived by those cultures. This is especially true given the varying cultural views on the utility of insurgency. Insurgency and Counterinsurgency: A Global Perspective provides the military professional with the vicarious experience of insurgency and counterinsurgency through the ages and across the globe. It fills a crucial gap in the Western understanding of intra-state conflict, particularly the cultural perspective on organized violence for political ends and its utility in cultures other than our own. While the predictions on the future of sub-state political violence may seem trite, Black justifies them by viewing them through the Western ethnocentrism that underpins our analysis. However, Western ethnocentrism is also the reason that this book contributes to the historiography of insurgency; it takes us away from our pre-conceived notions of the political ends and utility of sub-state violence. Despite the recent turn away from COIN, wars amongst the people will be an enduring characteristic of war. Andy Breach is a British Army officer currently attending the Advanced Military Studies Program at the School of Advanced Military Studies, Fort Leavenworth, Kansas. The views expressed are his own, and not representative of the views of Her Majesty's Government or the School of Advanced Military Studies. Header image: Chinese soldiers in riot gear secure the area outside the Id Kah Mosque, after Imam.